A visual exploration of the monsters who once ruled the Earth, Ultimate Dinosaurs explores the prehistoric world through photographic galleries complemented by lively, informative text, making it a delightful reference tool for children and adults alike. Travel along a conveyor belt to see a prehistoric timeline, piece together the parts of a missing dinosaur at an archaeological dig, or discover the secrets of the Stegosaurus by looking at a close-up of its skeleton. In Ultimate Dinosaurs readers will learn more about the beasts of the Triassic, Jurassic, and Cretaceous Eras — including what dinosaurs ate, how they defended themselves, and what might have made them extinct. My daughter Bridget saw the movie Jurassic Park last year and since then she’s been all about the dinosaurs. She studied them in her science class in school and I swear that kid knows more than I do. She can name all the dinosaurs and what they look like, who are the predators, what they eat, etc. Because of her love of dinosaurs, I’m always on the lookout for educational books that will interest her and maybe teach her a thing or two. She’s recently read the book, Ultimate Dinosaurs and her dinosaur knowledge base has expanded even further. 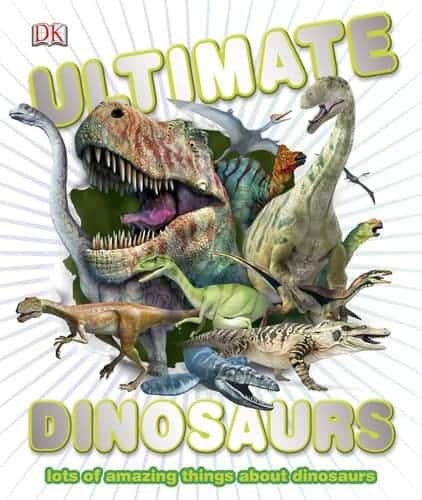 Ultimate Dinosaurs is packed full of information and has lots of pictures. Bridget is 8 years old and is able to read and understand the content. Of course, she says her favourite part is all the pictures, but I know she’s reading and learning at the same time. There’s four chapters: World of Dinosaurs, The Living Body, Senses and Behavior and The End. There’s dinosaurs that I’ve never even heard of before. The Cylindroteuthis? Liopleurodon? Sinocondodon? Those (and many others) were completely new to me so even I learned a thing or two! There’s a section on fossils which I found very interesting. It shows how fossils are made, the different types and clues to finding fossils. I also was intrigued by the very last chapter about the extinction of the dinosaurs and the theory is on the cause. Some species did survive though and they are listed in the book too! They include quite a few reptiles. We’ve added Ultimate Dinosaurs to Bridget’s growing library of books. I’m sure it will be one she will come back to often to look up her favourite creatures. My daughter would LOVE this! So, I would have to give it to her. I would to give it to my little Hannah, who loves animals and wants to be a scientist!!! My little girl! She loves animals and loves science! I have two boys that would enjoy reading this. When they were done with it I would donate it to the local school library where I work. MY oldest son would love this book. He loves learning about different things and loves dinosaurs. My two preschool nephews would get and really enjoy this book! I would give this book to my son! He LOVES dinosaurs! To my cousin! He loves all things dino! It would be great to win a copy of the book, Ultimate Dinosaurs for my nephew. If I won I would give this book to my son. My grandson is a dinosaur fanatic, so this book would definitely be for him. Hmmm I think the oldest nephew is a little old so I’d have to wait to give it to our son! My nephew is dinosaur crazy! My sons, they love dinosaurs! This would definitely go to my son. My four year old curator of dinos. Teddy loves to read about them, play with them, hide them and bath with them. This book is right up his alley, it could only get better if it had batman with the dinos! this would be for my 2yr old grandson, he is mad about dinosaurs. I have nephews who would love this book! Got a little man who would love to have this. we love dinosaurs here and would love to add this to our collection! To my grandson. He would love it. I would give this to my son, who’s obsessed with dinosaurs right now. my son, he loves dinosaurs! My son and daughter – they both love Dinos. My daughter! She loves dinosaurs! I would give it to my son. He loves dinosaurs. I would actually use it for my students or give to my school’s library.